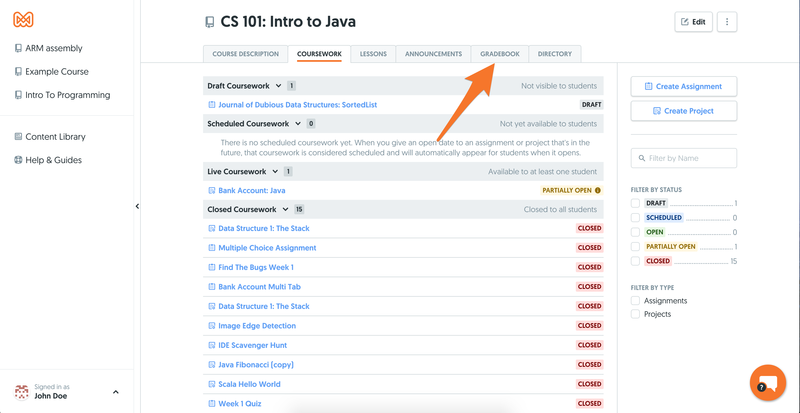 To retrieve a course grades from Mimir Classroom in CSV file format, first navigate to the gradebook for your course. Once you are in the gradebook, hover over the Export All Grades dropdown. Click the one for your LMS. This will download a CSV file that you can upload into your LMS to assign grades. The various learning management systems prefer different formats and methods for uploading these CSVs. We've done our best to conform to the format accepted by each supported LMS. Below you'll find guides for each LMS on how to upload the CSV. Note: If you encounter any issues, have a request related to exporting your grades to your LMS, or if your LMS is not listed below, reach out to us using the chat bubble in the bottom right hand corner of the screen. Blackboard has a standard CSV format and instructions for uploading it can be found here. Our Blackboard CSV fits these standards, however we make the assumption that the usernames at your school are equal to the first part of their email (e.g. "example" for "example@school.edu"). This will be true for most schools, however if students sign up with a non school email or your school uses a different username system, you may need to adjust this column slightly. Restricting the emails that your students can use to sign up will help eliminate this issue. If it takes a simple transformation to get your CSV working with Blackboard, message us using the chat bubble at the bottom right and we'll see if we can make a specialized CSV format for your school. Canvas has a standard CSV format described here. We use the User ID given to use by Canvas when students use the Single Sign On link for the User ID column. If this is not the correct User ID, be sure to message us. If it takes a simple transformation to get your CSV working with Canvas, message us using the chat bubble at the bottom right and we'll see if we can make a specialized CSV format for your school. Moodle requires more steps than the rest to import grades, but also provides some more customization. Here is a link to the Moodle documentation which will walk you through setting up your CSV upload. One thing to be aware of is that Moodle will deny your CSV and won't save any grades if you have students using Mimir Classroom whose emails don't match up with their emails on Moodle. You'll want to make sure student's sign up with the correct email, which can be aided by restricting the emails your student's sign up with. Desire2Learn has a CSV upload system described here. Our Desire2Learn CSV fits these standards, however we make the assumption that the usernames at your school are equal to the first part of their email (e.g. "example" for "example@school.edu"). This will be true for most schools, however if students sign up with a non school email or your school uses a different username system, you may need to adjust this column slightly. Restricting the emails that your student's can sign up with can help with this. If it takes a simple transformation to get your CSV working with Desire2Learn, message us using the chat bubble at the bottom right and we'll see if we can make a specialized CSV format for your school.